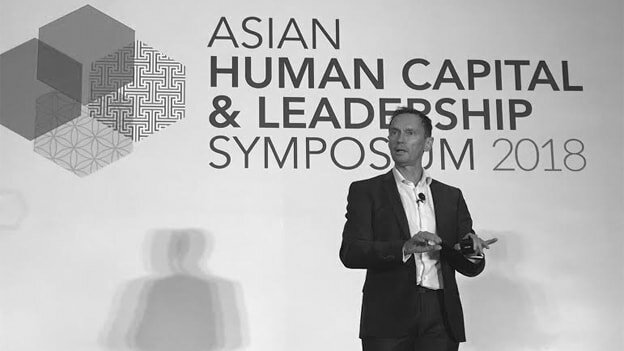 Craig Davis, Co-Founder, Sendle; Adjunct Professor, University of Technology Sydney, in his opening keynote at HCLI’s Asian Human Capital & Leadership Symposium 2018 in Singapore talks about what organizations can learn from startups to stay relevant in this “fast lane” world and climb the vertical curve of progress. In 10 years our attention span at the workplace has come down from 12 seconds to 8 seconds. We are checking our phones 157 times a day. Harvard research suggests that when asked what you are doing right now, 47 percent people responded that they are off with pixies – Believe it or not half of us are in an alternate world most of the times! Well, life is fast today and our concentration is going down. Period! Raymond Kurzweil in his book of Law of Accelerating returns talked about the fact that progress is like compound interest and the rate at which technology is disrupting the world is faster than ever before. Juxtaposing these two facts clearly mandates an exponential vertical learning growth for each of one of us to be able to keep ourselves relevant. This fact is true for us at all levels – individuals, teams, and organizations. In the face of this tremendous vertical curve there are only three strategies – climb, cling or fall. Craig Davis, Co-Founder, Sendle; Adjunct Professor, University of Technology Sydney, in his opening keynote at the Human Capital & Leadership Symposium in Singapore talked about what organizations can learn from startups to stay relevant in this “fast lane” world and climb this vertical curve of progress. He argues that large organizations should look at startups because they understand the imperative of speed, have very open and constructive leadership practices, bring on great people practices and believe it or not are winning talent war. Entrepreneurial mindset: Build an entrepreneurial mindset to be open to possibilities and have the courage to take risks while delivering results. Entrepreneurs have high ambition & big picture thinking. One of the biggest motivators for this group of people is initiating and starting off things almost immediately. They do bring in high reflection & patience. They are almost always interested in a lot of stuff and hence bring in high breadth but at the same time are low in depth & structure. Strategic focus: Startups are almost always time & resource-poor and high on ambition and hence it is imperative to get wholly focused on what matters. And the golden rule is to stay customer obsessed. Some of the key things that define the start-ups are the crazy obsession for the product market fit and focus on Porter’s idea of What you are not going to do. Google’s philosophy of Objectives and Key Results (OKR), which leads to everyone focusing on the common objectives and key results, has found ways into many startups. Another factor that differentiates startups is the focus on effectiveness over efficiency – Craig suggests that leadership styles at startups are such that they encourage opportunities that enhance the focus on output. There is enough research available that differentiates efficiency over effectiveness. And this focus on outcomes leads to startups putting values upfront when they hire candidates. A “Value-match” is what the startup works for that 9 percent successes rate over 91 percent failure rate. Speed: The traditional conundrums of “if you are faster, you can’t be better” or “if you are cheaper than the quality may not be good” have been challenged tremendously by the startups in today’s world. They are faster, better and cheaper. Some of the examples of the companies who bear these values include Amazon, Airbnb and Uber, among others.. Start-ups are agile natives by birth and truly display Daniel Pink’s story of self-determination – autonomy mastery and purpose. Soft skills are HARD SKILLS: It is proven through research that higher soft skills lead to better performance and higher resilience. One of the core skills of startup founders is self-awareness of their leadership style which favors resilience, openness, adaptability over the command and control carrot and sticks behavior. They will bedrock themselves for self- management, motivation and empathy. Insatiable curiosity: The biggest differentiating factor for startups. Curiosity for them is a habit of doing things in life and not just part of the job. Curiosity leads to a Tee shaped employee – one who brings both breadth and depth of information. Craig shared a model, which he suggested we should use as a GPS for us. He said that for everything there is 5percent that we know we know; 15percent that we know that we don’t know and 80 percent we don’t know we don’t know. Whether you belong to a large or small organization, you need to climb and maybe fall but not cling and not fall. Because if you don’t climb, some startup will come and eat away that pie! Closing it with a beautiful quote by Thomas Friedman, Craig urged organizations to embrace these 5 tips and risk the chance of failing and eventually learning. NEXT STORY: How can you make your employee’s first day memorable?